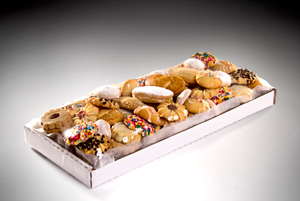 Cookies | Baker's Perfection, Inc.
A scrumptious toasted anisette flavored biscotti. 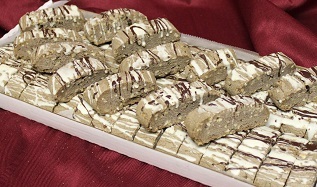 A flavorful hard chocolate biscotti drizzled with white and dark chocolate. An orange butter cookie topped with white chocolate drizzle. 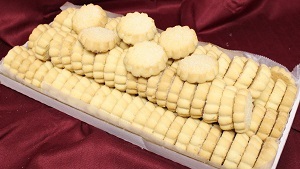 Italian butter cookie topped with sugar. 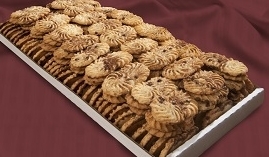 A flavorful sour cream spritz cookie topped with cinnamon and chocolate chips. 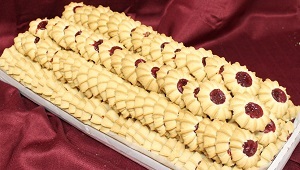 A flavorful butter cookie topped with a dollop of raspberry preserves. 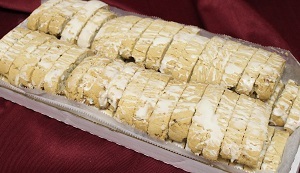 Delectable hard lemon walnut biscotti drizzled with white chocolate. 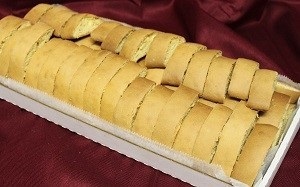 A delicious hard almond biscotti. A delicious soft almond biscotti swirled with chocolate, walnuts and Marschino cherries. 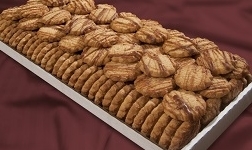 It is topped with sliced almonds and dusted with sugar. Caramel flavored butter cookie topped with a caramel drizzle. 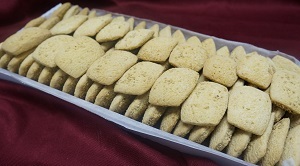 A flavorsome almond “S” shaped cookie. A scrumptious mix of cream cheese and butter with a hint of anisette flavor, decorated with rainbow non-pariels. A delicious butter cookie filled with a layer of rich chocolate fudge. A luscious lemon cookie topped with powdered sugar. 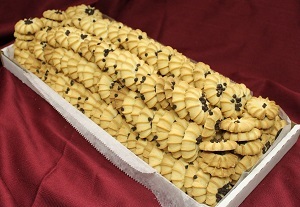 Italian style cookie topped with sesame seeds. A delicious butter cookie topped with rainbow sprinkles. 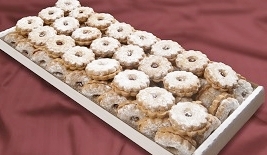 Raspberry preserve filled linzer sandwich cookie dusted with powdered sugar. A delightful butter cookiestopped with chocolate chips. A butter sandwich cookie filled with raspberry, half dipped in chocolate and topped with rainbow non-pariels. A delightful hard almond biscotti half dipped in chocolate. 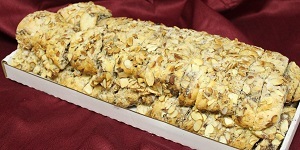 A wonderful assortment of almond, chocolate walnut and lemon walnut biscotti. 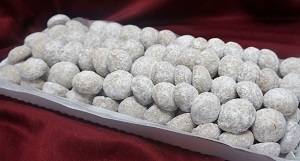 A delicious almond flavored ball shaped cookie covered in powdered sugar.